Do you feel the need to tell your particular story or just have the desire to look at words and sentences differently? Do you want to make your writing as clear as the planning that goes into it? If so, then Ron Rozelle's Wordsmithing 101 is for you whether you are a beginner or a more experienced writer. The instruction is geared to good writing in both fiction and nonfiction, with some special focus on memoirs. Participants will come away with a plethora of handouts. The three day writing workshop will be held at Blinn Student Center from June 17 through June 19. The cost $225. We will finish what we didn't finish yesterday. Then we'll critique the assignments of those who wish to take the leap and put their words "out there." We will also critique other short things that you wish to bring, time permitting. Today we'll critique short sections of bigger pieces that you bring, along with poems, memos, grocery lists, angry letters to editors, just about anything. Ron Rozelle, a 2007 inductee to the Texas Institute of Letters, is the author of eight books, including Into That Good Night, a memoir, The Windows of Heaven, a novel of the 1900 Galveston storm, A Place Apart, a novel set in modern day Ohio, Warden, coauthored with Jim Willett, and Write Great Fiction: Description & Setting from Writer’s Digest. He is the recipient of the Katherine Munson Foster Memorial Award and the Image Magazine Creative Prize. His memoir, Into That Good Night, the first non-agented property published by Farrar, Straus, & Giroux in over five years, was a national short list finalist for the P.E.N. Prize and the Texas Institute of Letters Carr P. Collins Award and was selected as the second best work of nonfiction in the nation for the year 1998 by the San Antonio Express-News. He has taught writing workshops at numerous conferences and universities, and was twice the memoir teacher at the Newman National Writer’s Conference at Mississippi College. His articles have appeared in a wide variety of publications, and he was the Barnes and Noble Author of the Month in both the Houston and Dallas markets. He has been a featured author at the Texas Book Festival in Austin and the Texas Folklife Festival in San Antonio. Touching Winter, a novel made up of a quartet of stories, was published in October, 2005, by TCU Press and was a short list finalist for The Texas Institute of Letters Best Fiction of the Year Prize. Sundays with Ron Rozelle, a collection of newspaper columns, was published by TCU Press in 2009. 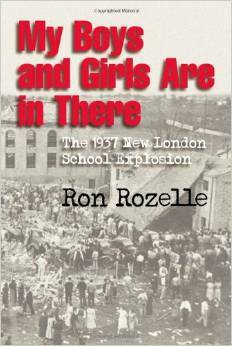 My Boys and Girls are in There: The 1937 New London School Disaster (Texas A&M University Press, 2012) was the recipient of the Calvert Prize, was pronounced the “sleeper hit” of the 2012 Texas Book Festival, and was a short list finalist for the Texas Writers League Nonfiction Prize. He and his wife Karen, a retired third grade teacher, are empty nesters and ecstatic new grandparents. An honorary Professor of Letters at Alvin College, Ron Rozelle is a graduate of Sam Houston State University, Class of 1977. He holds a Bachelor of Arts in English and Political Science. understanding of sensory description, attention-grabbing first sentences, mixing short and long sentences/paragraphs, powerful endings, knowing where the story really begins, and especially- getting rid of clutter! Ron taught all of it with great humor. A delightful weekend! I wouldn’t say he could help very much with your grocery list, but if you’re working on a novel, a short story, or writing a better letter, Ron Rozelle is a good man to know. He’s been there and can show you how it’s done. Several of us were fortunate enough to study with him during his last trip to Brenham, and he made quite an impact on the group. Many of us from that class continue to meet regularly to practice what he taught us and to critique each other when necessary. What makes Ron’s presentation so easy to digest is his years of experience in front of a classroom. He can write and he can teach-an excellent combination if you are wanting to learn the craft. I highly recommend you take advantage of the forthcoming opportunity to sit with him and learn. He will not disappoint. I participated in the Lifetime Learning writing seminar with author, Ron Rozelle in 2016. The best testament to its success is the fact that a group of us who attended have formed a follow up writers’ group. We meet monthly and critique one another’s work using the rules we learned in the seminar to guide our discussion. From his experience as a published author, Ron shared with us ways to develop good writing skills, practical do’s and don’ts, and many examples and stories about the craft of writing. It was a fast moving weekend that was challenging but really enjoyable. I recommend it highly. I signed up for the Writing Workshop with Ron Rozelle with a feeling of trepidation. I was out of my comfort zone. Mr. Rozelle quickly put me at ease. He is a great teacher – the workshop was informative, fun, and entertaining. He made me feel like I could write with work and I learned valuable tips about the writing process. I highly recommend this workshop for anyone who wants to improve their writing skills.